This AHM Pacific offering dates to late 1975. The retail price for this example was $65. 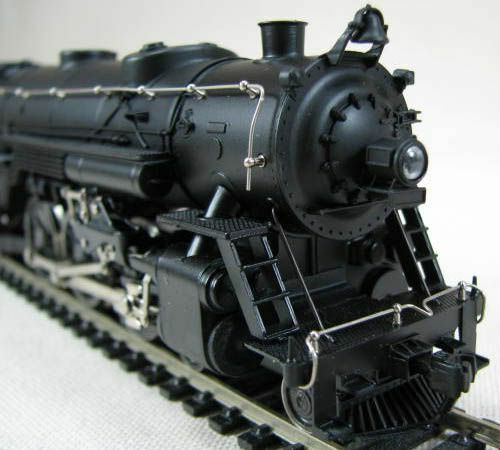 A review of the model may be found in the January 1976 edition of Railroad Modeler magazine. This Rivarossi-made 4-6-2 first appears in the AHM line in early 1973. 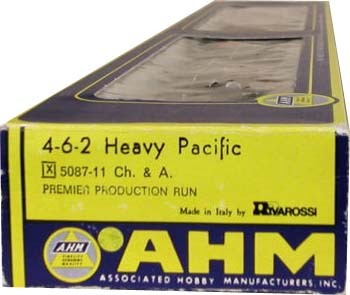 Model Railroader reviews the USRA Heavy Pacific carrying the AHM stock number series 5087 in its February '73 issue. The model is listed with a $38.95 retail in 1973 and three roadnames (B&O, Erie, Santa Fe, and a special edition Southern for $45.98). The retail price for this model is $89.98 in a 1977 AHM Current Price Listing. AHM's 1980 price list has the 5087-series Pacifics going for $198.98. IHC (International Hobby Corp.) lists five "Majestic Pacifics" by Rivarossi in a 1984 ad with a $137.98 retail. The release included the Milwaukee Road -Chippewa Hiawatha (#1214), Chicago & Alton -Alton Limited (#1530), Southern #1401 (#1535), B&O -President Filmore (#1540), and B&O -President Polk (#1544).